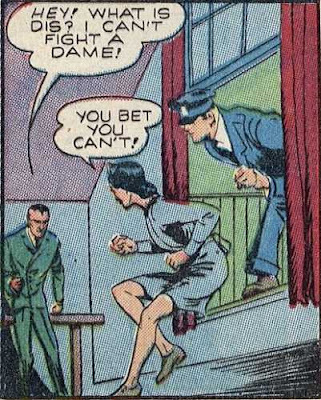 Castle Vardulon: The Sixty-Seventh-Greatest Panel in the History of Comics! 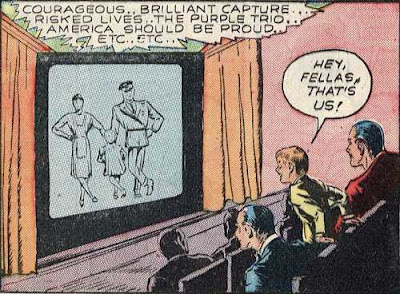 The Sixty-Seventh-Greatest Panel in the History of Comics! After failing to protect the fake baby, Warren and Rocky return to the millionaire's apartment where the scheme was hatched. 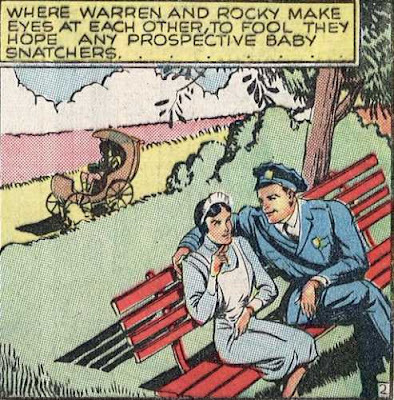 Then, for reasons that I won't hazard to guess, and despite the fact that this is where he got changed in the first place, so his clothes are there, Warren remains in the Nanny's outfit to run upstairs and thrash the kidnappers. And then continued to wear the dress long enough for the newsreel crews to show up and photograph him in it. I am more interested in the fact that someone going under cover to thwart a crime dreses like a policeman.